Test your own rate of reaction as well as your opponent’s: who’s faster, better, and more concentrated? One guy up against another… or, in my case, one girl up against another… even your kid brother will do. Find out just how good you are, so grab a worthy opponent and check out the educational game 2 Player Reactor. This review was written by Paulina Gegenheimer, a high school student and true Android fan. As the app’s name indicates, this game is made for two enthusiastic players. You and your opponent have to face each other in several short games. Each game you win earns you more points, which are automatically saved. As soon as the game starts brief instructions explaining how each game is to be played flash across the screen. All in all there are 19 different games to choose from, 12 of these are free. You can buy the rest of the games, as well as 4 Player Reactor in the Android Market. Names of colors are shown. Each word has a different color which doesn’t match the color it represents. 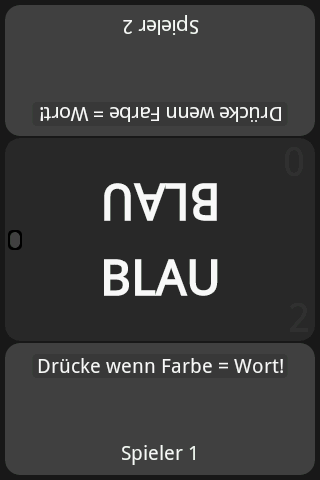 As soon as a matching word appears the players have to touch the screen as fast as possible. •	Can the mouse get the cheese? A labyrinth is displayed, on the one side of which there’s a little mouse and on the other side a piece of cheese, as well as some empty spaces. The players have to figure out where the mouse will wind up if she follows the line. If the mouse winds up next to the cheese, the player must touch the screen. 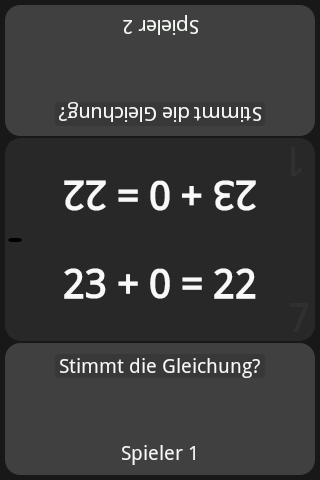 Mathematical equations are shown, and as soon as an equation is correct you have to touch the screen. The rules for each game are the same: whoever’s faster scores the pints, and the slower player loses some points. I find that 2 Player Reactor is a brilliant idea. There aren’t that many games that offer a two player option, and usually you’re up against virtual opponents. In this case, however, you’re up against a real opponent, so winning is even more fun! The screen is split into two parts. Each player has their own section as well as instructions before each game starts and an area in which the game is displayed. If ever you want to take a break you can set your phone on standby—this will automatically stop the game. When you start the app you can also make changes under Settings. You decide how many points should be allotted each time someone wins a game, how many games you want to play, and if the little games should appear in random order. Once you’re happy with how you’ve set the game up, just hit Play and let the games begin! The game’s graphics are relatively simple, nothing fancy, but very easy to get the hang of. I liked the brief and to-the-point instructions for each game—I often get bored when I have to read long instructions. The app’s speed is totally satisfactory. It reacts instantly and there are no annoying loading sessions. 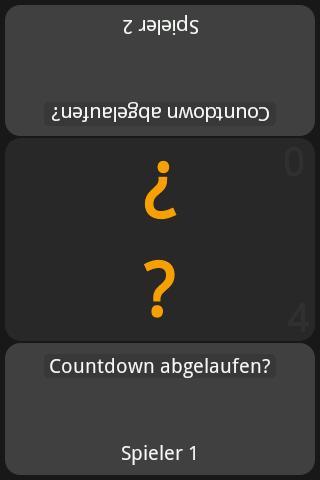 I didn’t experience any problems with the app’s stability during my test. 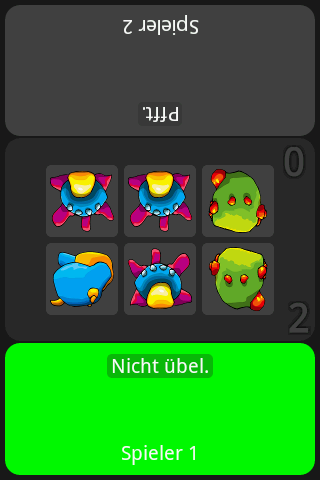 2 Player Reactor can be downloaded free of cost. 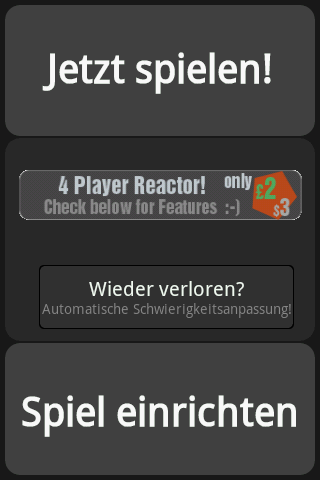 The more elaborate 4 Player Reactor can be downloaded for US$ 2,30 from the Android Market.